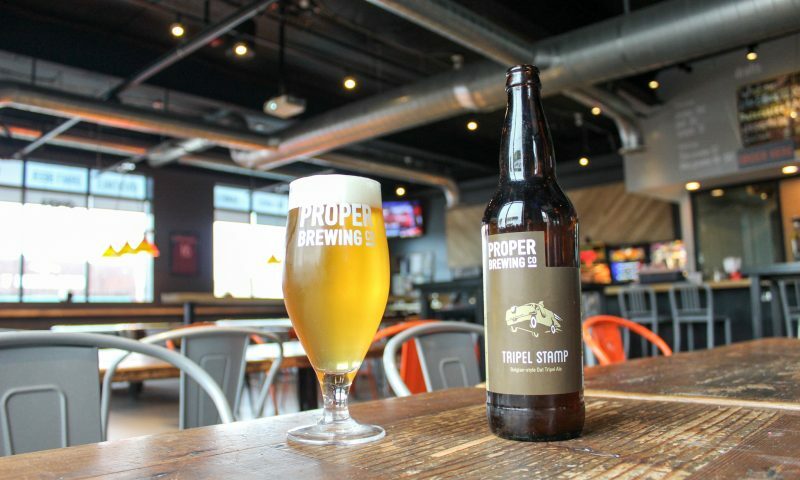 Tags: Beer of The Month, Proper Brewing co.
Rio Connelly and his skillful squad serve craft beer to thirsty patrons at Proper Brewing Co. His team also runs a longer-established, small-batch hot spot, Avenues Proper Restaurant & Publick House. Our impression is that they forego cliché brewing trends, sticking to classic styles that have stood for decades and even centuries. Connelly finds a thrill in offering a good variety, even digging up super-rare recipes or putting his own spins on a classic. 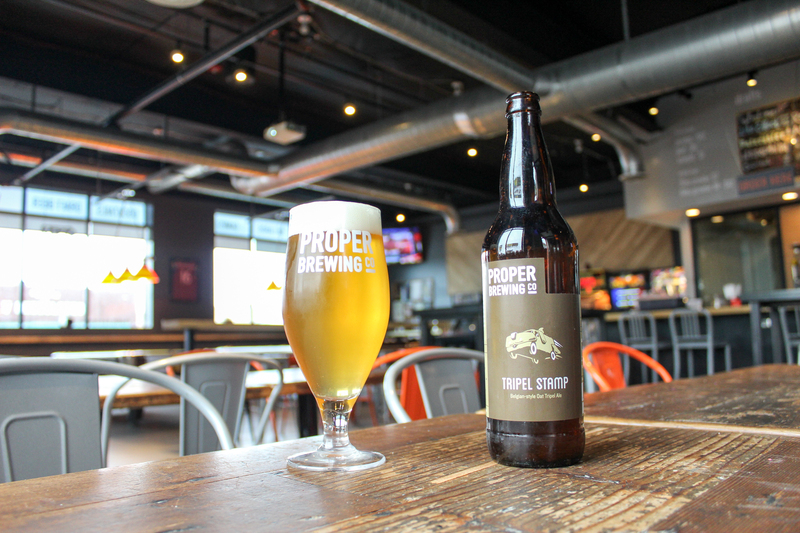 Proper Brewing Co. introduced the abbey-style ale, Tripel Stamp. This is a complex beer designed to take drinkers on a sophisticated journey while consuming the beverage. Built to embrace a delicate appearance with a high potency, Tripel Stamp is an homage to the Trappist monastery—the origin that helped the style gain its initial footing in the world. It seems that Rio and his own set of monks set out to bring the old world into the new. Tripel Stamp, a Belgian-style oat tripel ale, is offered in a 22-oz. bomber. (Another notable tribute is the clever label nodding to the Harry and Lloyd of Dumb and Dumber fame. That’s undoubtedly a classic right there.) When bending back the cap, a sharp and deliberate hiss escapes as carbonation fights to knife through the air. We transferred the beverage into a tulip glass to better showcase the distinctive characteristics of the style. The liquid pours foggy, golden-blonde in color, with hundreds of racing micro-bubbles climbing to the rim. White foam crests atop but dissipates quickly. Faint scents of fermented herbal fruits, ripe banana, citrus peel and hints of spice cake coil above the glass. A mouth swirl covers the tongue with active velveteen carbonation fizz. Pleasantly mild vapors of alcohol linger momentarily. This light and crisp beer is sweet like apple honey. All of these characteristics seek to mask the alcohol, which is lurking just slightly behind the curtains. Coming in at a hefty 9.3-percent ABV, Tripel Stamp has the potential to stamp you out if you are not careful. Delivering a number of beer styles, Proper Brewing Co. does an excellent job keeping things fresh. But given the fact they hold strong to such polarizing beers as the Lake Effect Gose or the popular Gruit proves that there will always be an appetite for deep-cut classic beers. Though it’s a seasonal release, Tripel Stamp has also earned its way into the crowd’s classic craving. “So when someone tries to tell you that you can’t Tripel Stamp a double stamp, just crack one open, plug your ears, and say lalalalalalalalalalalalala,” says Proper Brewing Co. Proper understands the importance of laying down a solid foundation and taking care of their customers. Connelly is a creative brewmaster who is always looking for ways to deliver something interesting for all. Please don’t get us wrong—new trends aren’t completely off the table, but their ability to show a level of restraint allows the Proper name to continue expanding and strengthening the brand. Recently, Connelly and his team opened another new location, Stratford Proper in Sugar House, and expect to open Craft By Proper in downtown Sugar House later this month. This presents even more access to an array of great beer, tasty food and a friendly environment—and everyone can appreciate a gathering place where beer flows like wine.